Origin of the term "Atheism:"
The term "Atheist" comes from the Greek word "atheoi" which means "those without God." The image above is of a fragment from "Papyrus 46" containing part of the Epistle to the Ephesians from the Christian Scriptures. In the past, Paul, a Christian Apostle and one of the founders of Christianity, was believed to be the author of the Epistle to the Ephesians, which he wrote during his first imprisonment in Rome circa 62 CE. However, starting in 1792, it has been challenged as Deutero-Pauline: that is, like many other New Testament books that claim they are written by Paul were actually written after Paul's death by another Christian author. The first verse in the Epistle, as translated in most versions of the Bible, indicate that the letter was addressed to the Christians "who are in Ephesus" in what is modern-day western Turkey. However, the reference to Ephesus seems to have been added later by an editor. The Jerusalem Bible notes that some Bible scholars think that the epistle phrase was originally a circular letter. The phrase "who are ..." may originally have been blank and later filled in with the name of "whichever church was being sent the letter." "That at that time ye were without Christ, being aliens from the commonwealth of Israel, and strangers from the covenants of promise, having no hope, and without God in the world." [Emphasis by us]. This papyrus was dated from circa 250 CE. I was born into a Baptist family and raised as a Protestant Christian. However, I became disillusioned with the faith during my teen years. I had never sensed the presence of God in my life or God's influence on the rest of the world. I had frequently tried to pray to God, but had no feeling of connections. Things that I prayed for generally did not materialize. Yet, none of the arguments against the existence of a deity convinced me that God could be proven to not exist. So I felt that my only ethical option was to became an Agnostic. I remain an Agnostic today, almost seven decades later. I expect to remain one unless I come across a convincing argument about the existence or nonexistence of God. I can understand the final statement above, but I personally disagree with it. Certainly, many Atheists would agree that a person "must follow the scientific method" to prove the existence of God before they can justify their theistic beliefs. However, I suggest that many Atheists, Agnostics, Monotheists, Bitheists and Polytheists -- would personally consider a sincere feeling of certainty about God's existence to be sufficient to justify a person's belief in one or more deities in the absence of an absolute proof. A common belief among conservative Christians is that a person chooses to be an Atheist for only one reason: if they were to believe in a God they would need to follow God's moral code as he/she has revealed to humanity. 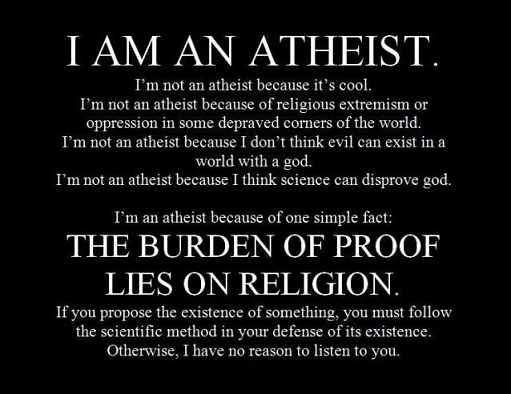 It may be a possible that some Atheists were so motivated, but I have never met any who would fit that description. Most are offended by this suggestion. The facts that persons identifying as Atheists are underrepresented in the prison population, while those identifying as Christians are over represented appear to contradict this belief. All the Atheists that I have communicated with assert that they have been ethically forced to become Atheists on purely logical grounds. They see no evidence for such being(s) and many see multiple indicators that such beings do not exist. To be true to themselves, they cannot accept the existence of God, for the same reason as the average Christian cannot accept the existence of Thor, Venus, Baal, and countless other goddesses and gods of antiquity: there is no evidence for their existence. Many Atheists would argue that for a deity to be omnipotent, omnipresent, omnibeneficient is logically contradictory. The arguments about Theodicy -- how can an all-good God allow evil to exist -- has not been adequately resolved in the opinion of many Atheists. It is worth noting that the only difference between an Atheist and a theist affiliated with the Baha'i, Christian, Judaism, Islam, Sikh, etc. is that a theist typically believes that many thousands of deities are none-existent whereas an Atheist has no belief in the same multiple thousands of deities, plus one. The image was uploaded to Wikipedia.com by en:User:Brian0918 on 2007-MAR. Licensed under Public Domain via Wikimedia Commons. The word "portmanteau" has two unrelated meanings: a word made up from two other words fused together, and a type of suitcase that opens up in to two equal parts. "ACLU" refers to the "American Civil Liberties Union," a national group with state offices that promotes civil liberties for all.